Guide to Beachtek Audio Adapters: Which one is Right for Your HDSLR and Camcorder? The Beachtek MCC-2 2-Channel Audio Adapter and Bracket is designed to attach to your DSLR camera and allows you to send two mono or one stereo audio source to your camera's audio input. It has two mono 1/8" inputs with individual trim control knobs as well as a stereo 1/8" input. A mono/stereo switch controls whether the two mono or one stereo input is active. It connects to your DSLR camera via a 1/8" stereo mini-jack output, and works ideally with cameras that have a headphone output to allow you to monitor your audio. 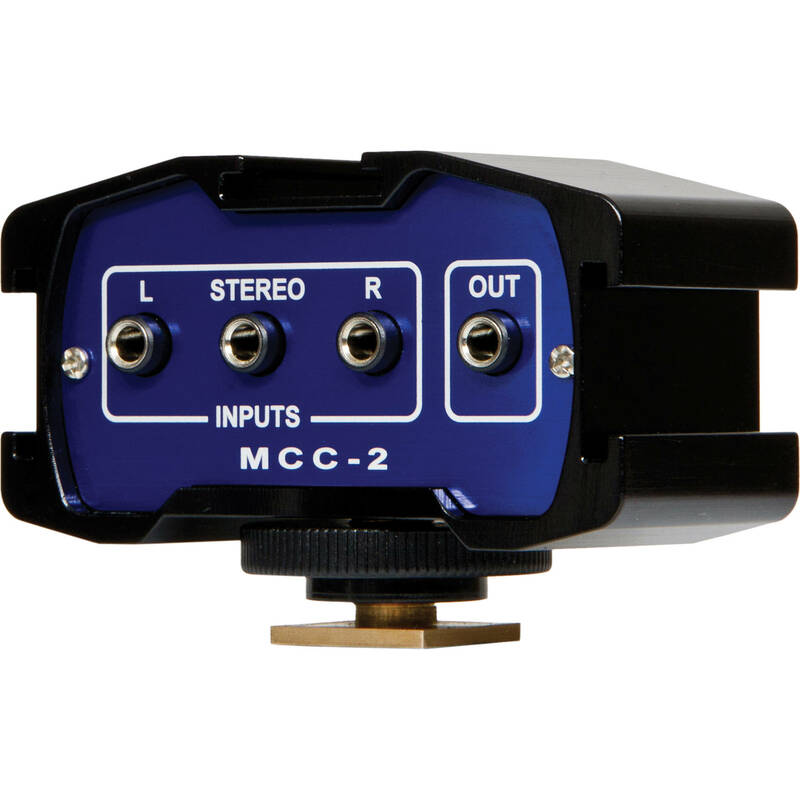 The body of the MCC-2 has three integrated mounting shoes to attach a variety of mics or wireless receivers to the unit. The MCC-2 itself will fit on any DSLR or camcorder that has a standard mounting shoe. It has passive operation, and thus requires no batteries or power source. Box Dimensions (LxWxH) 7.55 x 4.95 x 2.3"
MCC-2 2-Channel Audio Adapter and Bracket is rated 4.7 out of 5 by 16. Rated 4 out of 5 by Bono from Compact and light weight Build quality and finishing is very good. It's nice to have 3 cold shoes in a compact mixer. The L/R knob feels solid and precise to turn. In recording a live event with DSLR, I mount a shotgun mic to record the live audio and a Sennheisser wireless receiver to pick the audio from control panel, these 2 signals can be recorded as 2 different track with adjustable level. What disappointed me is the supplied cable tends to mix the 2 tracks so you get is mono actually (L and R is the same signal), luckily I ordered Beachtek SC35 Replacement Cable as well, which separate the tracks as it should be. Rated 5 out of 5 by Raymond T. from Must have for DSLR video Mount this to your camera's shoe. Mount a wireless receiver and mini shotgun to the side shoes. Add a shoe mount handle on the top shoe. You now have a sturdy, tiny metal mixer with dual pro mics and a handle for low mode shooting in your dslr for video. This is the smallest and cheapest dual-mic mounting and mixing solution that acts partly as a small camera rig. It needs no power. It's tough and super portable. For even full retail, this is a great piece for anyone who shoots video on a DSLR. It is not a replacement for dual-system recorders, like my FOSTEX DC-R302, but it's much more convenient to grab and go. Simple, useful, small and well-made. Get one. Rated 5 out of 5 by Ocean from Small is the new big! Have been using this with a Rode Videomic Pro and a Sennheiser G3 receiver on a GH4 over a week now. Very positive. I used juicedLink before. Yes it has XLR input and the gain sounds good, but it was just too bulky for run and gun works. Especially when both my mics are battery-powered, the extra gain is not that useful. I decided to try this thingy out. It met my expectations without much surprise. Except when I first held it in my hand, it felt solid, sturdy, but a little heavier that I thought. It's still light tho. It's a lot more compact than the juicedLink. There are pictures to compare. But of course, if I needed XLR inputs and phantom power, the MCC-2 is not even compatible. Overall, I like it. I can see myself using it very often, especially in documentary run and gun style shooting. Rated 5 out of 5 by BIP from Small package delivers 2-channel audio to HDSLR The main attraction of the Beachtek MCC-2, of course, is that it accepts input from two different microphones and, with the right cable, delivers the audio to a stereo input on the camera as two independent channels.? Or you can opt for one stereo signal.? Almost as cool is the fact that, after mounting the Beachtek to the hot/cold shoe on my GH4, I can mount other devices directly to it.? So my shotgun mic (Rode Videomic Pro+) and my wireless mic receiver (RodeLink Wireless Filmmaker) attach firmly to the Beachtek.? Being able to record -- in the camera -- from two independent audio sources with separate gain controls and not having to record one of those sources via dual system on another device saves enormous time and effort in post production.? Audio quality is great.? Love it. Rated 4 out of 5 by Tisa Z. from use with the 5d allows me to hook up my 5dmark ii with my wireless mic and record directly into the camera. Wish i could use a headset with the dslrr to hear the levels rather than just see them. Rated 5 out of 5 by filmmakwr from Very nice device If only I could here what is going in my camera through this device that would very cool. Rated 4 out of 5 by Caleb Berg from Great item! Replace cable. This is a terrific item feels solid and strong, like those metal hot-shoes are not going to break off! Doesn't work with all microphones though, so use recommended or be ready to try different ones. Works great with Sony UWP wireless mics and the right shotgun on other side. Like someone else said, the cable that comes with it is garbage & had to be replaced. Don't know why Beachtek would put mostly broken cables in these packages. Replace the included one! Does this transfer plug-in power? I have the saramonic version of this and it does not transfer plug-in power so mics like the Rode Video Micro can't be used with it. No, it does not have phantom power. Mics need to be battery-powered. What settings do you recommend for a Sennheiser EW100 body pack and a Shure Lenshopper VP83F on a Panasonic GH4? I suggest experimenting with the microphone's filters and gain switches for the best results in your particular shooting environment. The low pass filter is especially handy for cutting low frequency ambient sounds typically generated by AC units, fans, traffic, etc. I have had good results with the VP83F gain control set at about the +20dB level. In general, always use the lowest gain settings possible. The Beachtek would be set to MONO. Does a mic have to be powereed to work with this? I have a battery powered Shure that I know would work, but what about a cheap $8 corded lavalier that normally plugs straight into the camera? Would it work plugged into this instead? This is a passive mixer. The signal will pass through if you are connecting this to a camera that provides plug-in power. Hello there, I am new to DSLR Video. Can I connect a lav mic to this and get reasonable quality audio? This is basically a pass through device. It won't do anything to enhance or degrade the quality of whatever is fed into it. It will let you alter the mix from two sources by independently reducing the volume of each source. Answered by: John M. M.
Will this adapt straight to a canon vixia hf g 20 without the adapter being purchased separate? Yes this will work on an HFG10, HFG20, HFG30 without issue, you will just need a short mini mic cable from the output on Beachtek to the input on the camera. Hi, Iam sorry but I don't know if it is. I don't use that mic. I used a couple of lapel mics with it and I can't remember the brand currently as I am away. Will this accept line out audio from an audio mixer and attenuate it to work with a mic in port on a camera? You may be able to use the trim control knobs to pull the line level signal down to mic level but, without a VU meter or some way to test the resulting output, you may get low levels or distorted audio. It's possible, just a bit unreliable. Will this work with a canon vixia camera? I use with a vixia hfg-30 and it works great. I have two audio sources (wireless mic and a rode mic on the camera. You can use software to split the left/right channels while editing. If you have two audio sources I would highly recommend it.